When combined with the proper muzzle adapter or specialty barrel, these blank .223 rounds will make a great noise and effect for training purposes or amateur cinematography. 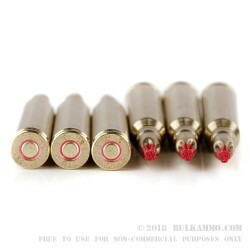 Each blank load is made using a legitimate brass casing which is made of the same material as a live round for proper feeding and safe chamber treatment. The base of the case has primer sealant surrounding a non-corrosive Boxer primer while the tip of the case is extended, crimped, and sealed as well. This creates a moisture-resistant blank cartridge that is always ready for use no matter the conditions. The noise and flash of this round are similar to those produced by 5.56mm NATO training blanks in use with the US military. 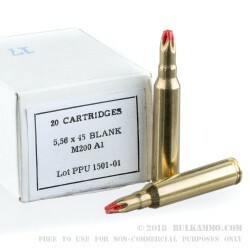 Blanks are still dangerous by nature and should be treated with care as propellant gases from the end of muzzle can still do quite a bit of damage at close range. Prvi Partizan is a Serbian company with a great reputation for quality and strict adherence to proper specifications.